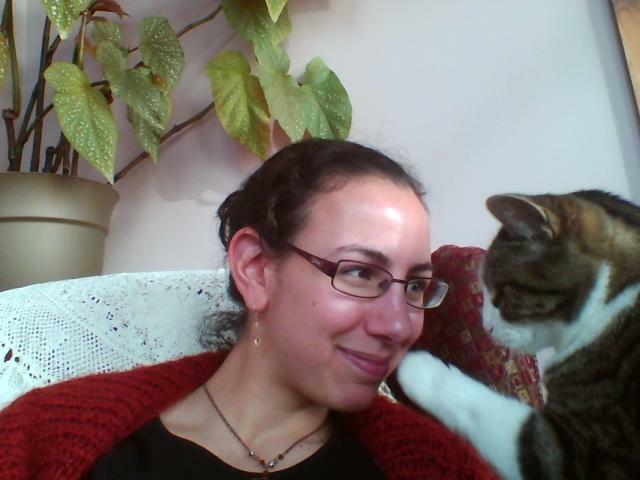 Last night I said goodbye to Nijmi, the cat who’s been with me for 16 years, just over half my life. She was, objectively speaking, the best of all possible cats. She was the softest, the sweetest, the kindest. She purred if you so much as looked at her. 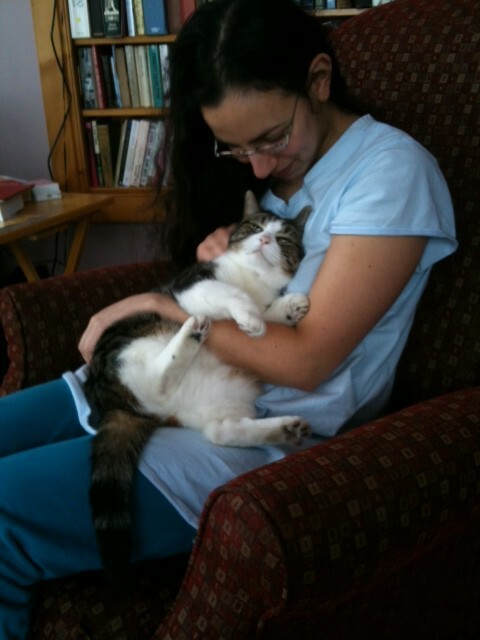 She loved cuddles. She hated having her nails trimmed. She would, when it was time for her to eat, jump up on the arm of whatever chair I was sitting in and gently paw at me. My mother and I picked her and her sister out of a litter together. My mother was drawn to a tiny calico, but I was enchanted by her darker sister, her black so black, her white so white, and all in between this shining silver tracery. She was luminous. Nijmi means Star. We took both of them, matched as day and night, and funnily enough until we lost her sister (named Shauna — I think we’d tried for Shams, the word for Sun, but it wasn’t quite right and suggested fakery in English, so we kept the Shh sound and went with it), Nijmi was more my mother’s cat and Shauna was more mine. But Shauna went out one night and didn’t come back, and after that I belonged to Nijmi more than anyone, as the rest of the family went to the UAE and my sister and I moved to the city. 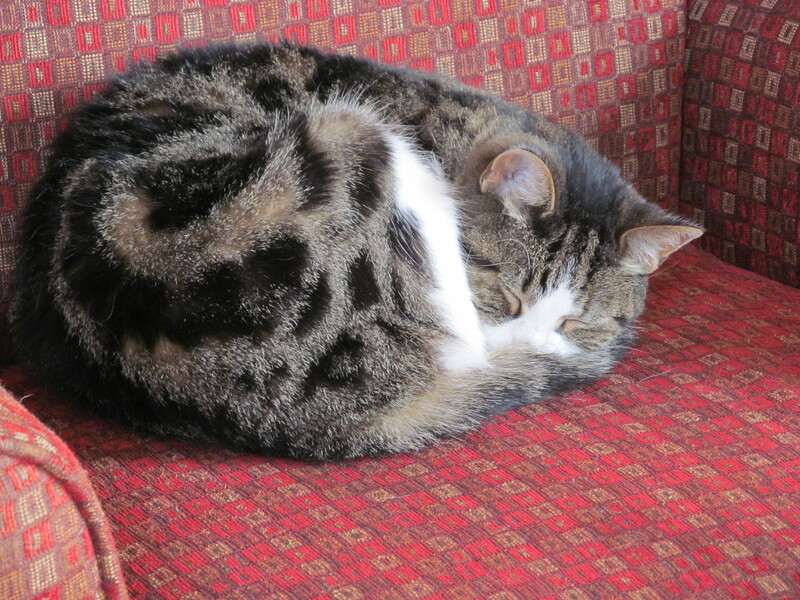 In her prime and even in her more venerable years she was a fierce and brilliant mouser. She scared raccoons from the fire escape in the flat my sister and I shared in Ottawa. She moved with me from my childhood home in Aylmer, to Luskville, to Ottawa, to Luskville, to Aylmer, and finally back to Luskville again. The only move she didn’t make with me was overseas. Whenever I’d skype with my parents, they’d tell me that she’d come trotting into the room at the sound of my voice. She had a fascination with sinks. 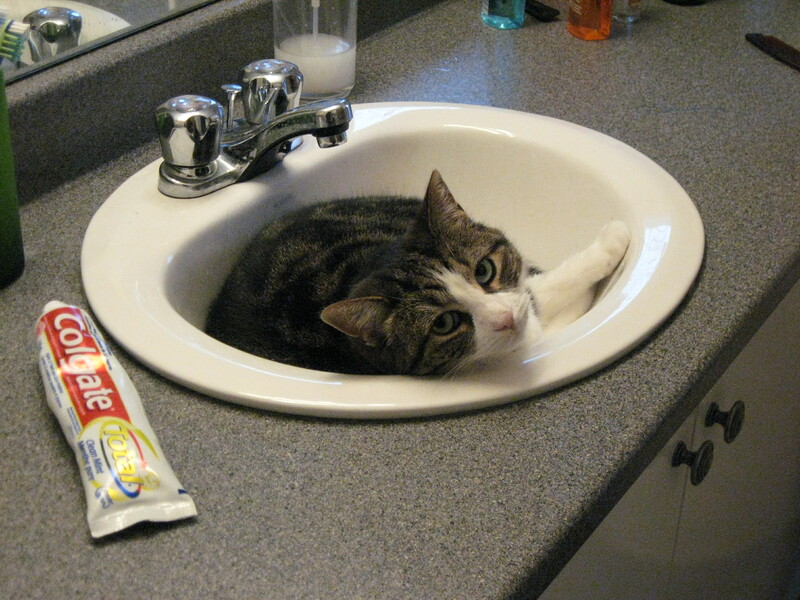 She was very much a faucet-cat, loved to have me stand by the tap running it for her drinking convenience. Bathrooms, water — she would stand outside the shower door waiting for me to emerge so that she could be the first to rub her cheeks and teeth and scent on me after I’d so inconsiderately washed them off. She loved music, too — or, at least, she loved instruments. 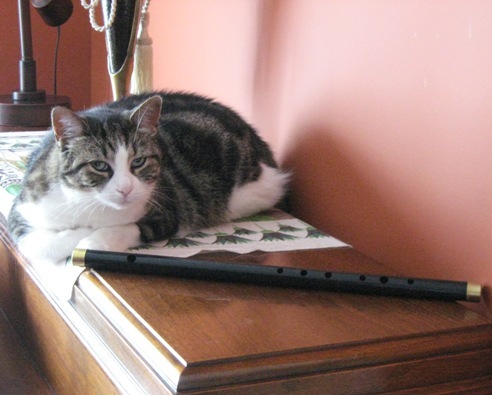 She would paw at the strings of my harp, or the soundboard, whenever it was accessible to her; she would sit next to my youngest brother while he played piano, just sleeping on the bench. She never seemed to sit anywhere else if he was playing, and always sat in a particular way, as if letting it wash over her. She lived through the loss of her sister and the arrival of a new cat, Fara, and through Fara’s subsequent re-homing last year. She lived through seeing a house bustling with six people reduced to two, then increasing, then dwindling, increasing again. She met my fiancé when he was only just recently become my boyfriend, and he gave proof of his worth by falling in love with her instantly (though she, wisely, as evident here, was determined to reserve judgement. She came around). She was a wonderfully companionable cat. 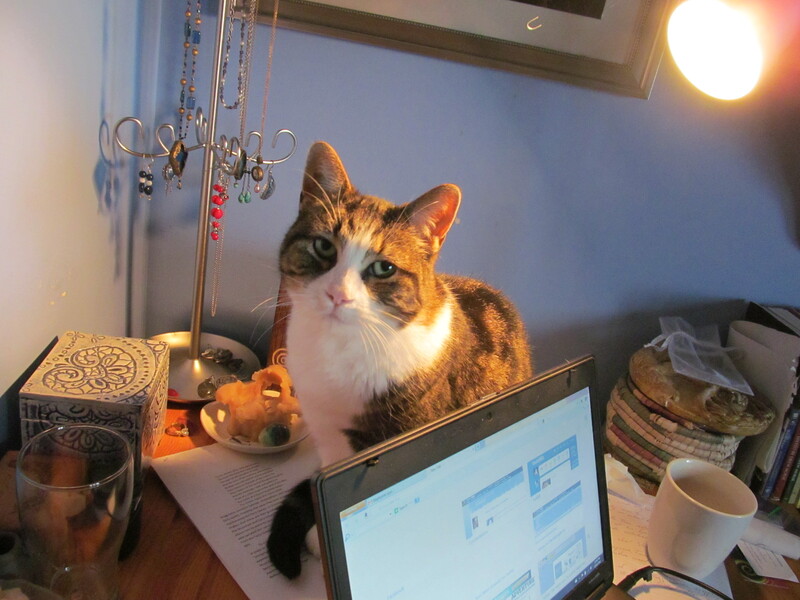 My laptop screen was always just the right size for her to curl up behind, such that I wrote essays, poems, stories, to the sound of her purr. 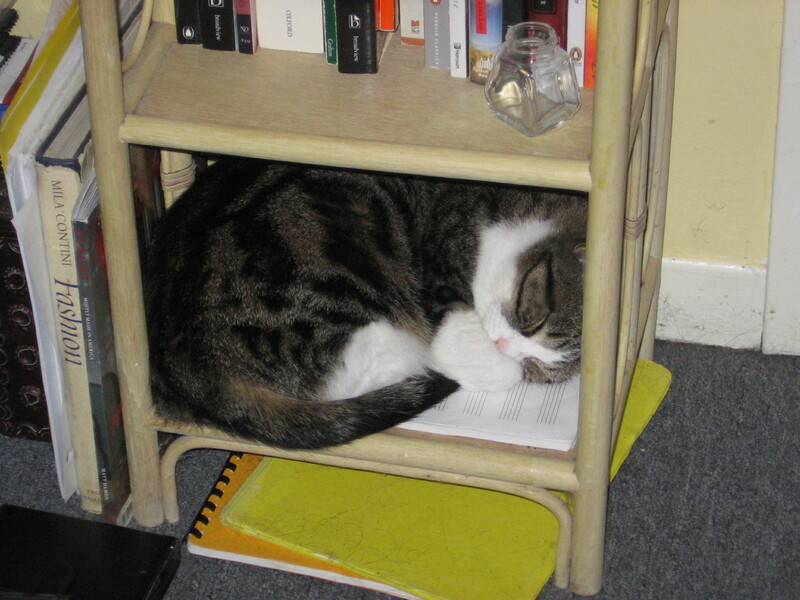 She made beds of discarded envelopes, frequently sat on papers I had to grade, which I’m sure was her way of looking after me if I began to look overwrought. She never got sick, never got upset with us in spite of all the upheaval that can and did take place in 16 years, was never anything but loving, gracious, comforting. 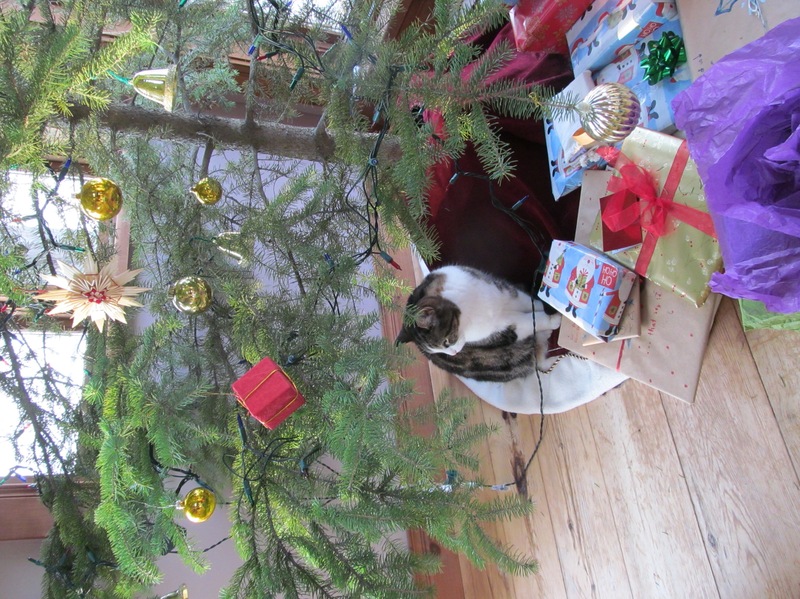 She was a gift, and and I hope she knew it. Then, in early May, she became indifferent to food and began to lose weight very quickly; a first vet visiting was astonished by how good were her teeth, joints, organs for her age, but found she had a fever, so prescribed a broad spectrum antibiotic that helped for a bit. But a week or so after the antibiotics had run their course she was still looking poorly, so I took her to a clinic in the nearest town, where they found a cancerous mass in her intestines that had metastasized into her lungs. From there on it was palliative care, until yesterday. She stopped eating on Sunday, was barely drinking, and had shifted from sleeping on soft surfaces to hard; she had some trouble with a hind leg and moving around as her body consumed itself. She gradually stopped walking more than a few steps away from where she slept, and it hurt to watch her even shift position. I looked at her and saw her just waiting to go, trying to sleep herself away. I’ve never had to put a pet down before, and I’ve been taking it very hard. I made the call to a vet who’d do home euthanasia, to spare her a hated final car journey, and in the end it was my mother and me holding on to her and crying as she slipped away. The wind was blowing something fierce, yesterday, but there was no storm; it helped to think of the wind shaking her loose from a dying body while the sun set. The wind died when she did. Today, it’s been grey and rainy while I wrote this, and I’m grateful. I hope she knew how completely we loved her. I hope we made her feel how much she brightened our days and nights just with the look of her, sleeping, purring, patting my face for attention. We gave her the best we could, and I miss her so much. This entry was posted in Uncategorized and tagged Nijmi. Bookmark the permalink.